Tabby is the original "concrete" of Florida that was used by early settlers. Rather than stone as an aggregate, sea shells were crushed and added to the mixture of sand, lime, and water. Tabby was selected as the exterior finish material at the main entrance and patio to make an important historical connection to the region through the use of this indigenous material. 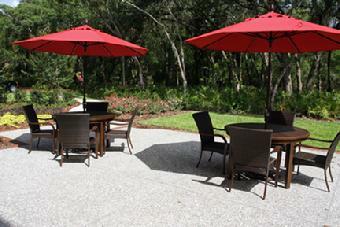 Adjacent to the woods and river, the patio serves as an exterior team gathering place for relaxation and group meals. The building�s orientation exposes visitors to the natural features of the site, creating a formal garden approach from the south. 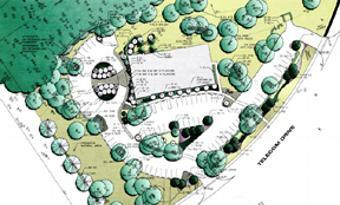 The selection of landscape elements that are native plants provides a more lush softscape and allows the project to better fit into its surroundings. 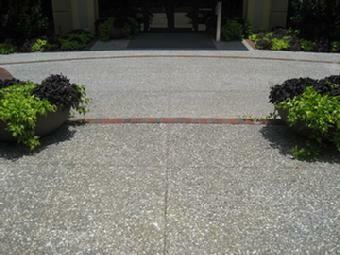 Accent colors of native plant material enhance the aesthetics of the building. The use of turf grass was limited in favor of more sustainable landscaping materials.